EUR/USD pair developing inside a symmetrical triangle since mid-February. US to release March Retail Sales and the NY Empire State manufacturing index. It was another dull week for the EUR/USD pair, as it continued trading in a tight range around the 1.2300 figure, to settle at 1.2331 amid dollar's weakness, fueled on Friday by a worse-than-expected preliminary Michigan Consumer Sentiment Index for April, which printed 97.8 from the previous 101.4, also well below the expected 100.5. Sentiment has been dented by political uncertainty particularly coming from the US, resulting in the pair gaining some ground despite the imbalance between both central banks that should favored the American currency, as the US Federal Reserve surprised with a hawkish tone in its latest Minutes, while the ECB offered a neutral statement, with no hints of future easing. Well after financial markets closed last Friday, US President Trump announced a missile strike on Syria alongside with his European allies, France and the UK. The strike was a response to the chemical attack on local citizens allegedly coming from dictator al-Assad, triggering a response from Russia, which warned about the consequences of attacking its ally. Over the weekend, the market knew that it was a "one-stance" warning, the second in a year, and not the beginning of WWWIII but clearly is another factor that fuels uncertainty and will likely have an impact on financial markets. Particularly in the case of the EUR/USD pair, demand for the high yielding common currency will be limited, but given that the dollar is far from market's players first choice, more range-trading could be expected. The US will release some relevant data on Monday, including the NY Empire State Manufacturing Index for April and March Retail Sales, these last, expected to show a modest pickup, but the influence on price should be limited as the risk sentiment will continue leading the way. Technically, the EUR/USD pair has been developing inside a symmetrical triangle since mid-February, with the range shrinking week after week. The situation could continue but the longer it extends, the more relevant will be the following rally, once the pair finally breaks out of it, one way or the other. In the meantime, the daily chart presents a neutral stance, with the pair hovering around a directionless 20 DMA, although above a bullish 100 DMA that provides a major support around the base of the figure, in the 1.2220/30 price zone. Technical indicators in the mentioned chart remain attached to their mid-lines, with no clear directional strength. 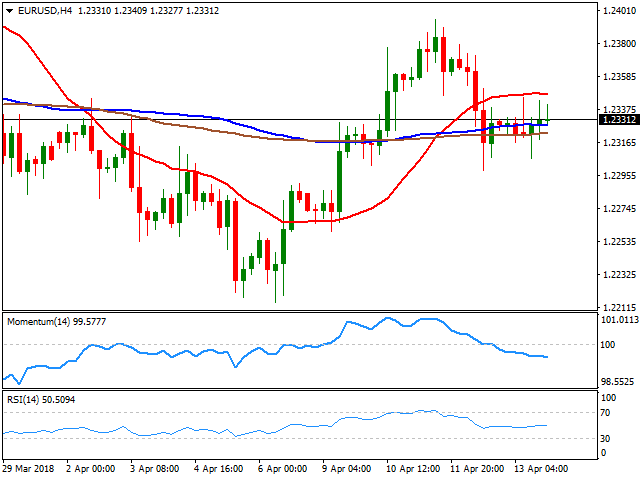 Shorter term, the pair presents a neutral-to-bearish stance, as in the 4 hours chart, the upside is being contained by a flat 20 SMA, the Momentum indicator heads lower within negative territory, while the RSI heads nowhere around 50.